These personalised light boxes are tailor-made to suit your taste, and can be used for a range of purposes that are only limited by your imagination! •A fantastic children’s night light. By providing a small amount of ambient light, making it suitable for night time feeds and nappy changes. In later years it is a perfect children’s night light and will provide comfort to toddlers or children who may be frightened of the dark. •A great piece of décor for any child’s room. Not only does the night light look fantastic, but it also encourages children with name recognition. •An unusual gift idea, excellent for baby shower gifts or even as a gift for birthdays and Christmas. 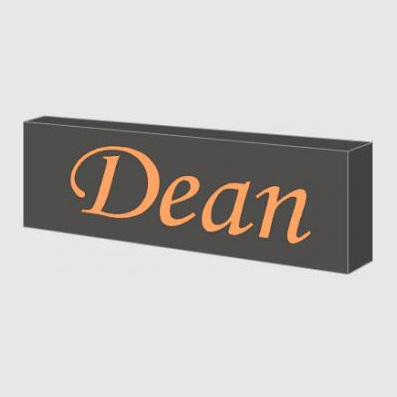 •A striking bar, shed or games room novelty item. Each light comes with the standard warm white. The second option is the ultra RGB light. The ultra RGB light allows you to set the light to any colour & comes with a remote control. Select from 16 different colours. You can set the RGB light on one particular colour or let it fade through the range of colours. The remote can also be used to dim the light up and down. The cost for the RGB late is an additional $39.95 on top of the base rate of this light. Upgrade to RGB light is $39.95 just put in comments section and we can fix your invoice. IMPORTANT: It will take 5-10 business days to make and this does not include shipping time.